On November 2, the General Assembly of the IHCO reelected Fundación Espriu CEO Dr. José C. Guisado as President for another four years. The members of the IHCO, who met in Cape Town, also elected Dr. Eudes Aquino from Unimed of Brazil and Dr. Toshinori Ozeki from Hew Coop Japan as Vice-Presidents. Dr. Ricardo López from FAESS, Dr. Jagdev Singh Deo from KDM and Ms Vanessa Hammond from HCCFC were also elected as members of the Board. 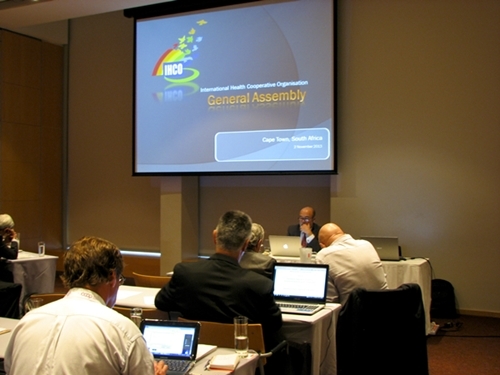 At the meeting, Dr. Guisado presented a detailed report about the activities undertaken since the last General Assembly held in Cancún on November 2011. Other important issues reported by members were the project launched in Malaysia to open 1000 cooperative pharmacies across the country over the next 5 years; the implementation of the Age-Friendly Primary Health Care Centres Toolkit in Japan, the work developed at Unimed’s Quality Innovation Center or the research initiatives launched in Canada.